Lawyers often pay lip service to looking forward to retirement. However, when pressed on the subject, many admit that their true feelings are mixed. Those who equivocate may have good reason: for many professionals, the adjustment to retirement can be psychologically challenging. A 2013 study¹ showed that retirement increased the risk of clinical depression in British men by 40 per cent. Related research has shown that professionals, and especially male professionals, draw much of their sense of personal identity from their work. When work ends, retirees can struggle with a loss of a sense of self. Lawyers may feel that, in retirement, their views are no longer relevant; or even that their lives are suddenly without purpose. Making a happy and healthy adjustment to retirement requires reflection, planning, and a willingness to seek support when it’s needed. We share some ideas about these strategies here. Earlier in this issue we discussed how to prepare for closing your practice; but it’s equally important to prepare for your new lifestyle. Retirees often report an exciting first year of retirement in which they undertake travel they’ve always wanted, or move to a new home. But the year following that “honeymoon phase” can be a letdown. – like fantasy trips – but also about the day-to-day. What will it be like when you are not travelling, not spending time with children and grandchildren, not working on your garden because it’s winter? Reflecting on everyday life post-retirement can lead some lawyers to grasp at ways to fill the time – not only hobbies, but also charity or project work. These activities can be satisfying, and keeping physically and mentally busy has been shown to support mental and physical health. However, “solving” the “problem” of free time can give a soon-to-be retiree the illusion of being prepared without actually having performed any real introspection. How will I describe myself, when introduced to new people, once I’m retired? Do I have any critical views of retired people that could turn into self-criticism? For example, do I view retired people as lazy, boring, opinionated, etc., and what can I do to challenge those stereotypes in my own mind? When I imagine myself telling others I am retired, how do I imagine feeling? Proud? Sheepish? Old? Do I imagine rhyming off a list of professional commitments I’ve maintained, and if so, why do I feel the need to do this? Do I have any secret fears? For example: running out of money, getting bored, drinking too much, or getting tired of my partner? Confronting these worries ahead of time is much healthier than assuming you’ll be blissfully happy all the time. Talking about concerns with a trusted friend – ideally someone who has already made the retirement transition – is even better. It’s equally important to sit down with your spouse, if you have one, and compare expectations. You may be surprised to discover that your visions of what retirement will be like don’t completely align. One spouse, for example, may expect to spend a great deal of time as a couple, while the other imagines developing new friendships and individual hobbies. Talking explicitly about expectations can minimize misunderstandings and even conflict later on. All major life changes require an adjustment period. Thinking back to your first years as a lawyer, as a spouse, or as a parent can be a powerful reminder that life changes involve a process of growing into a new role. Most lawyers understand that retirement involves a priority shift, but many are surprised that this change is gradual, not instantaneous. After decades of a routine built around work, it’s unrealistic to expect that you will wake up on Monday mornings without feeling like there is somewhere you need to be. But soothing these dissonant feelings by piling on new responsibilities only postpones the required priority shift. Instead of over-scheduling yourself, consider committing to the practice of patience about your emotions as your routines change. You will grow into your role as a retired person just as you grew into your role as a lawyer or a parent; but it will take time. Be careful to avoid making irreversible commitments – whether to a new part-time job, a volunteer post, or to providing day care for grandkids – before your new priorities have had time to solidify. Be patient. As you think about what kind of person you will be in retirement, do yourself the great favour of being intentional. Don’t take on a second career because others assume you will, or because they have been asking if you will. If you choose to do volunteer work, don’t just accept the first option that presents itself. Instead, choose opportunities carefully with clear objectives in mind. For example, if you see volunteerism as a way to build new friendships, sitting in your study drafting grant applications for a local charity won’t achieve that. If you do find that retirement has an impact on your mental health, don’t ignore it. Depression, anxiety, and other psychological disorders are amenable to a range of different treatments. Mental health issues are a very common reason for visiting a health care professional – you won’t be laughed out of the office for being dissatisfied with your new life of leisure. 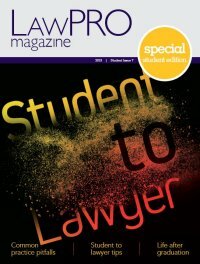 As a retired lawyer, you also have the option of accessing resources from Homewood Health, which provides the confidential Member Assistance Program (MAP) for Ontario lawyers, paralegals, judges, students at Ontario law schools and accredited paralegal colleges, licensing-process candidates, and their families, with financial, arm’s-length support from the Law Society of Upper Canada and LawPRO. To learn more about the MAP, please visit myassistplan.com or call 1-855-403-8922.